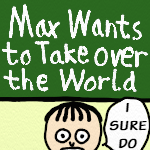 Max is an ambitious but lazy school kid who has the desire to take over the world. He might need better company than his friends to pull this off, but you may as well just enjoy the show anyway. I'm going to end it here, the problem with this format was that I wanted larger stories than a four panel format would allow. For each comic I needed to retell the information to make each joke work, because the probability is that somebody who hasn't read the series before would see the one on the front page, and I didn't want them to be confused about anything. But then I wouldn't get a lot of space to tell a joke, let alone try to make it good (I think most jokes in the comic worked, but there were a couple in the last bit that I were a little iffy on.). I'm going to do something different, still haven't worked out entirely what it is, but it will be entertaining, the comic will mostly be text, but it will feel more organic. Hey guys. When I'm making this comic I prefer the writing to the drawing. I might start something new that's more text based, but there will be some visuals to make it look nice. This comic is good but I want to make something that's longer. I'm still gonna finish this bit on the story because I think it's good and I think that writing it is going to help me on my next project. Please stay tuned for updates. I'm really excited by it and I really think you guys will enjoy it. I had trouble squeezing it into four panels, so I tried a "complex maneuver" in the last one. I think it works. Also I forgot to add the teacher's moustache until the last minute.